You may have noticed, it can be like pulling teeth with some vendors if you request itemized pricing. Two of the few, if only industries that have been able to hold on to their “trade-secrets” are the medical trade and mortgage lending. However, if you did the research, you could write your own mortgage. One of the last industries to succumb to the “give everything away for free” business model is the paper media industry. Newspapers fought the long hard fight to maintain paper subscriptions even while free news stared them in the face, online. When it comes to social media the major theme is “give everything away.” A company needs to make money but sustainability is achieved by forming long lasting relationships with your client community. Give everything you can, away for free. By everything, I mean information. Promote transparency and no more secrets. This is a heavy request for some industries but not so much for others. The old school taught many to hold on to their knowledge and industry secrets. Imagine if you will, Company A keeps its secrets ‘close to its chest’ and Company B is more forthcoming. Company B has Open House events at their office, gives tours, readily answers emails clearly from end-users trying to do it themselves. In addition, Company B provides quotes with every item quoted, priced individually. When a client eventually needs the billable services of A or B, which Company will the client probably prefer to do business with? Company B.
I believe the payoff is in the community and relationships you develop by being transparent. The internet is filled with answers and information. Most likely the information you choose to withhold is readily available somewhere, on the internet. I sit on the board of the International Technology Rental Association and the membership is split on the value of social media. Everyone can see value in maintaining a presence but we are split in how much time should be dedicated to gaining more presence. I must say, I fall on the side of dedicating time for increasing your internet and social media presence. One secret still held close to some company’s chest is itemized pricing; especially in the service oriented field. Maintaining a competitive advantage used to depend on keeping the client in the dark on the details of how the end total is achieved. Pricing an entire event as an event planner is similar to pricing the audio visual only, for large A/V events; it is priced as a package. At A.V. Rental Service, Inc. we publish our standard price list here for all the world to see. The negative backlash I hear is “this could run customers off if they think something is too expensive.” True, but the value and appreciation we receive for being transparent, well outweighs a losing a possible DIY client. In addition, I would rather be a little out of someone’s budget online than publish an unbelievably low price and later force the client to pay a hidden charge, which some companies do; leaving a bad taste in the client’s mouth. There are times and special events that we are able to offer the lowest available price that still allows us to make a profit. These are special situations where there may be value for us in another manner. In 2014, we provided a large amount of audio visual and lighting equipment for a medium sized booth on the New York Comic Con main floor. At the end of the day, we did not make a profit from the equipment rental but what we did achieve is contacts for future projects, resources for future New York business, hours of video footage and we met DMC, of Run DMC fame(Joke). My point is we did profit from taking the gig and basically giving everything away. Alternatively, know…when to charge and how much. In an effort to gain clientele some new companies succumb to the pressure to offer the lowest price to win a contract. Eventually you learn… you may not want to win every contract or event you bid on. Being aware of the value of your services is one thing but remaining steadfast at that number can be a challenge when faced with the possibility of losing a contract. The value of a company’s services is determined by the company. Making that determination can be one of the hardest task. Again, being confident in that final determined value is imperative. In the event planning business, ‘value-added’ pricing and ‘skim pricing’ works in the best interest of the company and the client. Educating the client is at the heart of this business model. Ensuring your client understands the value of your service is of the utmost importance to your client agreeing to your price. So take them on that tour of your facility, explain in detail exactly how you plan to execute their vision. In your estimates, include detailed drawings, diagrams and specification sheets that will not only overwhelm them with information but make them feel comfortable and confident they will be making the correct choice by using your company. Are you contemplating NOT using uplighting for a wedding? In a perfect world, where the sky is the limit; I recommend placing 1 Par Uplight every 4 feet. Additionally, in this scenario I would be placing pars on every wall within the reception room. Lastly, in this same scenario we would incorporate a DMX controller to change the lighting throughout the night. For Instance, if the wedding has a 3-color scheme and 3 walls with uplighting, we could assign one of the colors to each wall and then later have the entire room in one of the 3 colors and fade between the other two, slowly. Most weddings are on a smaller scale and as the budget decreases, the distance increases between each Par Uplight. More often than not, we are placing 1 par every 8-10 feet. Another option for lowering your overall Lighting expense is maybe choosing only 2 walls for uplighting. Well, A.V. 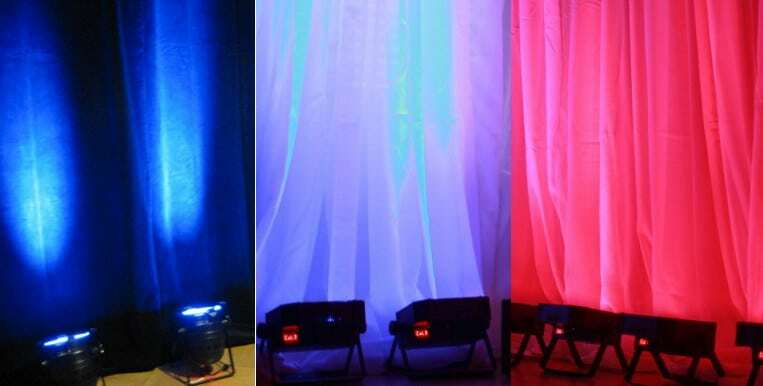 Rental Services, Inc is now offering a $199 UpLighting Package. Now hold on, The $199 Package only gives you 4 Wireless Puck Par Uplights but 4 Uplights can make a great difference and add some very attractive color in your reception room. Plus, that price includes set up and delivery! Full Disclosure: The great benefit with the Wireless Puck Par uplights is the fact they are battery powered and capable of using wireless DMX. This cuts down on our labor cost; we arrive to the venue, set up the lights and are ‘out of there’ in about 30 minutes. This means much lower labor cost, which translates to the lower rental charge and thus the $199 4 Puck Package! Regardless of your wedding budget I highly recommend saving a portion for Lighting. With our new $199 4-Puck Uplighting Package it is more doable than ever. Let A.V. Rental Services, Inc. ‘UpLighten’ your wedding Load and impress your new In-Laws! As A/V professionals we correspond and work alongside event planners on a daily basis. In addition we work alongside the end user/client. There are times, during an event when a client will suggest a better way to do our job. In all honesty, during some of those times I have picked up a tip or two on a better way. Having so said, this article is not to discount the planner or client but to remind everyone to stay open to new ideas and suggestions. Many times a new and efficient discovery is made from a non-audio-visual pro. This is true for all . Now that that is out of the way lets discuss 5 situations and how to handle them. Below are examples from me and my colleagues’ experiences; questions or concerns, posed during the execution and preparation of an event. 1. No Thanks, I do not need a microphone. I have heard this line from presenters in front of audiences as large as 100 people. I always recommend a microphone and sound system for audiences as small as 20-25 people. In small groups the microphone and speakers are required only to amplify the presenter’s voice and should not be used to blow out an audience’s eardrums. Response: The microphone is necessary for attendees seated closer to the rear. Even though your voice is powerful, often there is someone trapped between or near other people who may be holding private conversations at a low volume but loud enough to prevent them from hearing your presentation. 2. I forgot to mention I have videos in my PowerPoint, can we play them? Hear ye, hear ye…Presenters far and wide, do not keep vital information such as playing videos in the PowerPoint or videos at all, from your event planner. In addition to the planner, ensure this information trickles down to the audio visual provider, prior to event day. When this information flows efficiently it also means we can prepare for the now known video resolutions and match appropriate projectors for the best video quality, on screen. Response: Of course we can but it is always helpful to have this information ahead of time so we can have all the equipment prepared and up and running, before you arrive. 3. It was not on the floor plan but can the laptop live on the podium? Floor plans are an efficient way to filter information to every one involved. Detailed floor plans supply every trade involved (banquets, catering, audio-visual, lighting, staging and even the talent) with information necessary to at least start setting up the room without having to ask, or bother anyone with questions. Response: Yes we can handle the change but be advised it entails re-running video cables and possibly audio cables from the old location to the new location and we will do everything we can, not to delay the event start time. 4. My laptop always works, let me do it. Response: (If you are sure you correct the issue) Sir or ma’am, I have worked with laptops just like this. If you have something else you need to do, feel free…I will get the laptop on screen before you know it. 5. The last issue is a question for event planners, presenters and all other AV clients. Scenario: Your program is starting in 10 minutes, the AV technician has checked the microphone batteries, powered on and placed the lapel microphones on all of the presenters and have them muted at the audio mixer. However, the first presenter demanded we leave his microphone off and he will power it on when he begins. Lo and behold, he begins his presentation and forgets to turn his microphone on. How would you like your AV technician to handle this situation? A. Let the event continue until the first break. B. 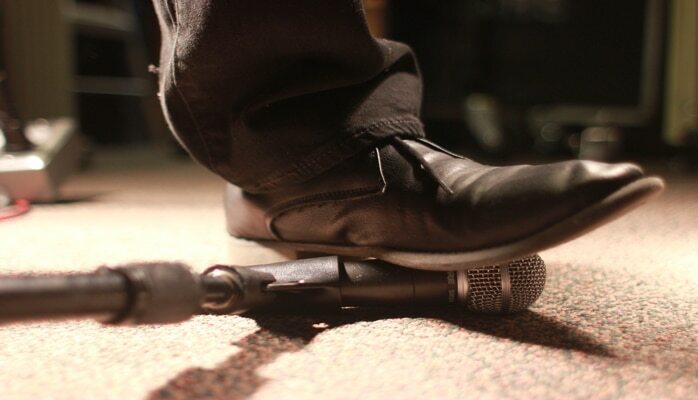 Have the technician go onstage and power up the microphone or hand him a new mic. C. Same as ‘B’ but this intro is too important; stop the presenter first. Always let your AV provider know 2 event times. Most, if not all audio-visual providers work on 3 event times; arrive time, set time (up-n-running) and start time. Most planners will provide a start time but the other two are crucial to a flawless event. The AV provider can determine an appropriate ‘arrive’ time; given the planner provides the ‘set’ and ‘start’ time. Next time you are giving details remember to provide a set time and start time. If you enjoyed the post, please click the thumbs up icon above and let me know!